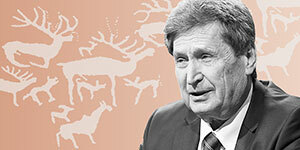 Anatoly Panteleevich Derevyanko (dob January 9, 1943, the Kozmodemyanovka village of Amur region) is an outstanding Soviet and Russian historian, archeologist, a professional on paleolith of Siberia and the Far East, a public figure. Doctor of historical sciences (1971), the full member of AS USSR (1987). Academician-Secretary of the Division of historical-and-philological sciences of RAS in 2002-2013, a co-chairman of the Russian historical society. A supervisor of studies in the Institute of Archeology and Ethnography of SB RAS, the chairman of the United Academic Council on the humanities (since 1983). He is the winner of State premiums of the Russian Federation (2001, 2012), Demidov Premium (2004), and the M.V.Lomonosov Big Gold Medal of RAS (2015). Academician A.P.Derevyanko has developed a new space-time version of the ways of Asian initial colonization; he has created periodization, chronology, and dynamics of paleolith in the region. He was involved in archeological expeditions on the territory of Siberia, the Russian Far East, Dagestan, Uzbekistan, Kyrgyzstan, Kazakhstan, Azerbaijan, Vietnam, Mongolia, Korea, China, Japan, Iran, and Montenegro. Expeditions he headed discovered and studied dozens of archeological objects in Northern, Central, and East Asia. These objects became the benchmark artifacts for various epochs and cultures within the chronological range from the Stone Age to the Iron Age. A.P.Derevyanko is the initiator and the head of the program on the complex study of paleolith cave artifacts in Southern Siberia and Central Asia; is the founder of the international research site «Denisova Cave» (Altai Mountains). He heads the programs for integration research of archeologists with representatives of natural sciences (geology, chemistry, biology, genetics, soil science, etc.). Under his guide and through his involvement, the groundwork for a multidisciplinary approach has been developed to analyze archeological sources. His scientific-and-organizational activity is extensive as well. Anatoly Panteleevich is a member of the Presidium of SB RAS, the Chairman of the United Academic Council on the humanities of SB RAS, the editor-in-chief of «Archeology, ethnography, and anthropology of Eurasia» magazine, the associate editor of «the Bulletin of Russian Academy of Sciences» journal, the Chairman of the Academic Council of IAET of SB RAS and the Dissertational Council in IAET of SB RAS, a member of the NSU Academic Council, the Chairman of Editorial Council of a series «Folklore Monuments of people of Siberia and the Far East», a member of the Presidium of RAS (2002-2013). Works of the scientist are of high appreciation abroad. He became a member of various scientific organizations: a corresponding member of the German Archeological Institute (1984), a foreign member of the Academy of Sciences of Mongolia (1998), a corresponding member of Montenegro Academy of Sciences and Art (2008), a foreign member of the National Academy of Sciences of Republic Kazakhstan (2013). A.P.Derevyanko is doing a lot to prepare young archeologists. For many years he heads the sub-faculty of general history of the humanitarian department of Novosibirsk State University; he lectures on the bases of archeology, on the early Iron Age of the Far East, on archeology of the Stone Age of Northern, East and Central Asia. He conducts seminars and special courses on different aspects of Asian paleolith science and promptly publishes them in the form of manuals. His direct disciples include more than 60 doctors and candidates of historical sciences. One of the main achievements of A.P.Derevyanko in pedagogical and scientific-and-organizational activity is that he created a unique school that was based on the ideas and methods to apply complex ways in paleolith research with natural and exact disciplines actively involved. Merits of A.P.Derevyanko are properly assessed by the state. He is the winner of the Lenin Komsomol Premium (1972), the State Premium of the Russian Federation in the field of science and technology (2002, 2012), of Demidov Premium (2004), of academician M.A.Lavrentyev Premium (2005), of the «Triumph» Russian National Premium (2005). He was awarded with the Labour Red Banner (1982), Honour (1998), «Merits for the Fatherland» of the IV degree (2002), North Star (Mongolia, 2006), and Friendship (2012) orders. 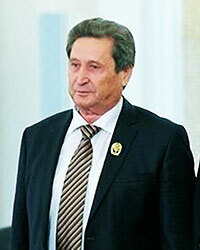 Anatoly Panteleevich is the author of more than 1000 publications (including more than 100 monographs). Several works are published in 15 foreign languages. 1. Dyeryevyanko Anatolii Pantyelyeyevich // Rossiiskaya akadyemiya nauk. Sibirskoye otdyelyeniye: pyersonal'nyi sostav. - Novosibirsk: Nauka, 2007. - S.78-79. 2. Prizvaniye - arkhyeolog / V.I.Molodin i dr. // Nauka v Sibiri. - 2013. - 11 yanv., N 1. - S.4-5. Updated: Wed Feb 27 14:46:30 2019. Size: 11,892 bytes.